the Third Avenue by-pass Rainbird Trail. 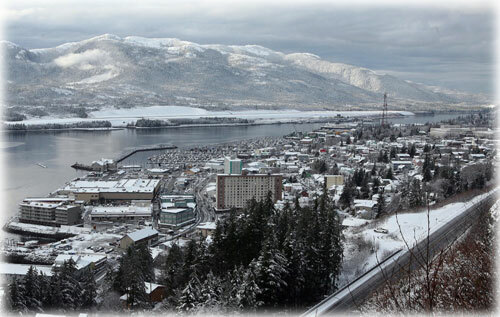 Ketchikan: PeaceHealth Ketchikan Medical Center Ranks in Top 1% - PeaceHealth Ketchikan Medical Center is in the top 1% of all Critical Access Hospitals in the United States. The 2011-2012 Hospital Strength Index™ ranks PeaceHealth Ketchikan sixth out of more than 1,300 critical access hospitals. When you compare all 4,500 acute care hospitals, PeaceHealth Ketchikan places in the top 25% nationwide. 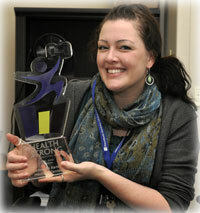 Melissa Leary Hanis, PeaceHealth Ketchikan Medical Center's Patient and Family Services Coordinator, holds the HealthStrong award. Alaska: Delegation Wants Equal Treatment for Alaska’s Fisheries; Lawmakers Seek Commitment for Transition Funds As Others Receive Ongoing Support - U.S. Senator Lisa Murkowski, U.S. Senator Mark Begich and Congressman Don Young, Alaska’s Congressional Delegation, sent a letter to Dr. Jane Lubchenco – the National Oceanic and Atmospheric Administration (NOAA) Administrator – making the case that Alaska’s waters should receive the funds necessary to improve operations, while similar endeavors are being funded on an ongoing basis in New England and on the West Coast. Alaska: Survey: Abrupt permafrost thaw increases climate threat - As the Arctic warms, greenhouse gases will be released from thawing permafrost faster and at significantly higher levels than previous estimates, according to survey results from 41 international scientists published in the Nov. 30 issue of the journal Nature. Permafrost thaw will release approximately the same amount of carbon as deforestation, authors write. However, the effect of thawing permafrost on climate will be 2.5 times greater because emissions include methane, which is a more powerful greenhouse gas than carbon dioxide. Northern soils hold around 1,700 billion gigatons of organic carbon, around four times more than all the carbon ever emitted by modern human activity and twice as much as is now in the atmosphere, according to the latest estimate. When permafrost thaws, organic material in the soil decomposes and releases gases such as methane and carbon dioxide. Alaska Science: Flying machines for the dirty, dull and dangerous By NED ROZELL - Some places in this world are just too dirty, dull or dangerous for human pilots to fly. An airspace in the latter category is anywhere near gas flares in Alaska’s oilfields. 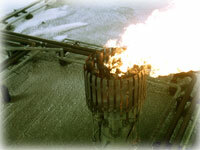 With only a few seconds of warning, flames blast high in the air from a network of pipes, releasing the stress of sucking oil from deep in the ground. A shot from the 5-megapixel camera installed in an Aeryon Scout recently used to help oilfield workers determine the condition of the business end of gas flares. Greg Walker recently found himself taking a look these fire-breathing nozzles near Prudhoe Bay, but he was barely close enough to see them from where he stood. He instead watched a “flying king crab” that buzzed around flaming flare heads 50 feet above the ground. The 2.5-pound flying machine captured video and five-megapixel images of the flares and their support pipes, some of them jacked by frost and needing repair. Walker’s mission was to help oil-company workers for BP order expensive parts they need to replace during scheduled maintenance next summer. He used one of BP’s Aeryon Scouts, a four-propeller flying machine BP had purchased for use on the Deepwater Horizon oil spill. BP collaborated with Walker and his team because they are experts on operating unmanned aerial vehicles. As the manager of Poker Flat Research Range, part of University of Alaska Fairbanks’ Geophysical Institute, Walker is assembling a fleet of these tools in an enterprise that makes he and his team very busy. Salmon, Desserts & Friends: A fantastic collection of scrumptious recipes, fishing stories and captivating images depicting the magic of Alaska's commercial fishing lifestyle. 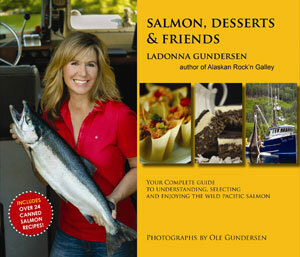 Ketchikan: Tastiest Catch: Alaskan Fisherwoman’s New Salmon Cookbook Will Get You Hooked - For LaDonna Gundersen, author of Salmon Desserts & Friends (paperback, 135 pages, $18.95), catching, cooking and eating salmon is her passion. A California girl, she got hooked on Alaska, fishing and husband Ole (not necessarily in that order!) more than twenty years ago and has never looked back. As chief deck hand and galley cook on the LaDonna Rose, their 32-foot commercial fishing vessel based in Ketchikan, Alaska, she’s responsible for all their meals. These are often prepared on the fly, on a rocking and rolling boat, in a tiny 4x7 foot galley (kitchen). Yet she refuses to stock the galley with ‘heat and eat’ pre-prepared foods and instead has become adept at serving up scrumptious, inventive, quick and easy-to-prepare salmon dishes. During the summer season, Ole and LaDonna eat salmon five times a week, sometimes twice a day. These meals form the basis for the newly released Salmon, Desserts & Friends. The pages of the cookbook are filled with creative yet simple recipes fit for land and sea. The book is accompanied by gorgeous photos taken by Ole of the dishes, Alaskan scenery and the commercial fishing lifestyle.